The Bronx is the only borough of New York City situated on the American mainland. Formerly a wilderness of forests, meadows, and streams inhabited by various Indian tribes, The Bronx was settled by the Dutch in the seventeenth century. Marginally separated from upper Manhattan by the narrow Harlem River, The Bronx quickly became a convenient destination for migrants seeking to escape the overcrowding and high costs of Manhattan. The Irish first came to the Bronx in the mid 19th century as gangs of laborers who constructed the New York and Harlem Railroad, the Hudson River Railroad and the High Bridge. Their back-breaking and highly dangerous work inspired the saying that American railroads had “an Irishman buried under every tie.” Later, Irish migrants filled the newly-built Bronx factories or commuted to jobs in Manhattan. They settled their families in neat wooden frame houses within the Bronx neighborhoods of Mott Haven, Melrose, and Highbridge, where they tended to pigs, cows and chickens and cultivated vegetable gardens in the backyards. 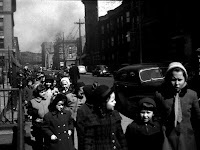 Other waves of immigration in the early twentieth century brought Italians, Germans, and Eastern European Jews to the Bronx. 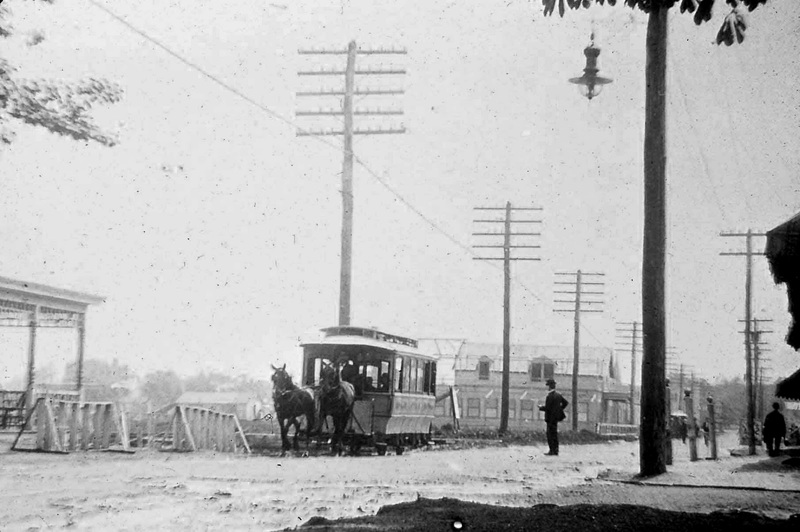 At the same time, Manhattan subway lines extended north and attracted furious development. Brick walk-ups sprouted seemingly overnight, lining street after street, providing rental housing to the mostly working class residents and transforming the Bronx into its own city. By the late 1920s, the Bronx was booming with over 1.2 million people, mostly first- and second-generation immigrants who worked as carpenters, brick masons, house painters, tailors, garment makers, store clerks, small shop owners, and salesmen. 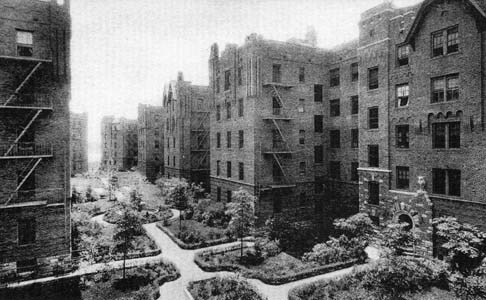 The Bronx community of the 1930s was self-sustaining for a majority of its residents, complete with new apartment houses, tree-lined streets, spacious public parks, good schools and ample shops. Social life blossomed on stoops and in apartment courtyards, weaving a tight fabric of community life. Millions of Americans came to know the Bronx through “The Rise of the Goldbergs,” a popular radio and, later, television show depicting the lives of a Jewish family from the Bronx. The Bronx that greeted Irish immigrants in 1930 was a hopeful place, but one that could not escape the growing despair of the age. Despite its charms, The Bronx was hit hard by the Depression. 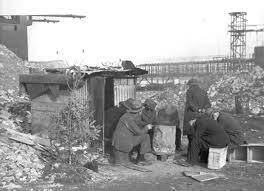 A Hooverville emerged on the Harlem River near Highbridge. New construction dropped 75% from its 1920s highs. Evictions tripled throughout the city. Many Bronx Irish sought refuge from their dire circumstances in the predominant institution of Irish culture since the arrival of St. Patrick: The Catholic Church. 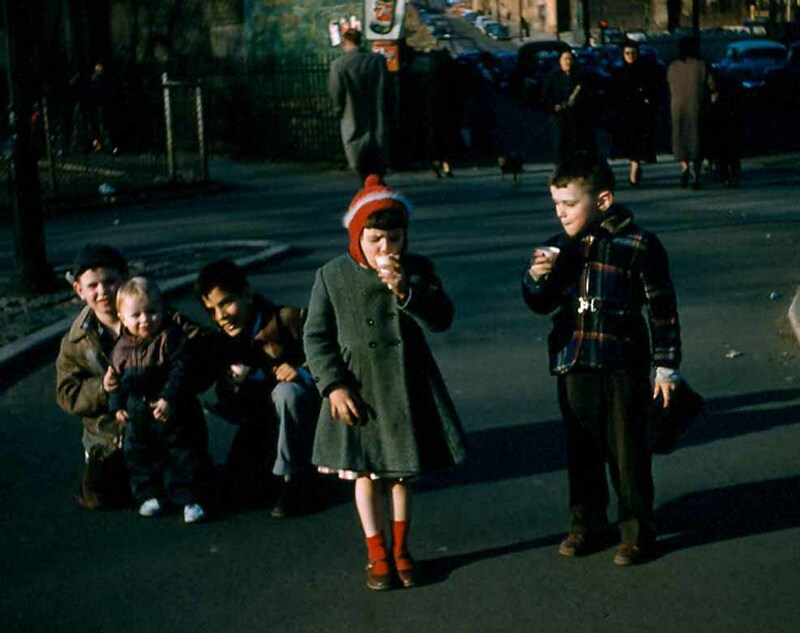 Community life in Bronx Irish neighborhoods revolved around the Catholic Church. Catholic churches and schools were abundant in Bronx Irish neighborhoods and were commonly attended by the children of Irish immigrants. Youngsters descended daily from apartment stoops around Bronx Irish neighborhoods and paraded up the avenues to the school grounds, filling the morning air with shouts and laughter. Mobs of parishioners filed through church doors for mass on Sundays and holy days, or to celebrate a wedding or bid farewell to a loved one. The highlight of spring featured First Communion processions down major thoroughfares, followed by graduating eighth-graders in the early summer. Irish American boys played pool, ping pong or boxing in school recreation rooms and joined girls at church dances on Friday nights. 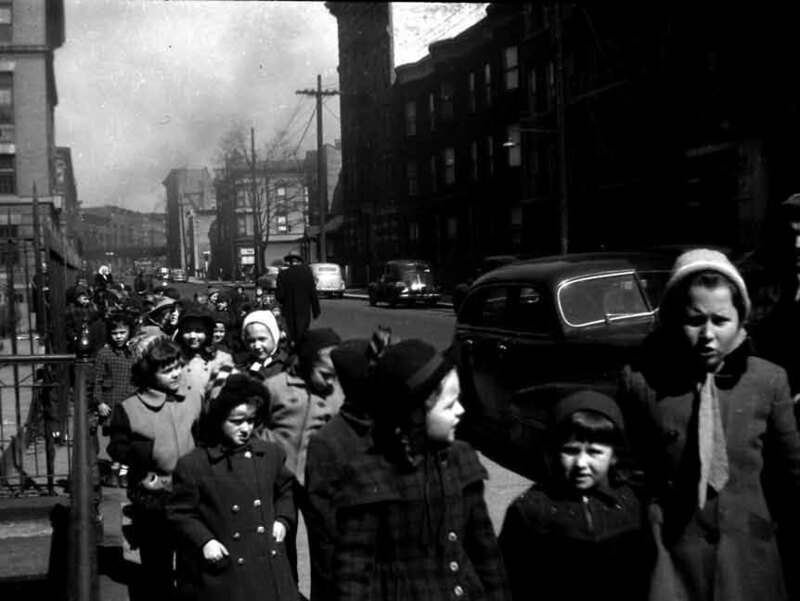 Catholic priests walked the neighborhoods, mingling with parishioners and keeping the children out of trouble. Nuns sold carnations outside churches every May to celebrate motherhood. Beyond church grounds boys played in the streets -- games like stick ball, hand ball, kick the can, pitching pennies, Johnny on the pony, and marbles. Girls played jacks, hopscotch and jump rope. Kids raised pigeons or flew kites on rooftops and raced gleefully through alleys and courtyards. Adults congregated and watched over neighborhoods from stoops and fire escapes. In summer, kids opened fire hydrants or flocked to sprinklers and wading ponds of nearby parks for relief from the sweltering heat. They rented bikes for 25 cents, jumped on a mobile merry-go-round for a few pennies, and sat on blanketed fire escapes after sundown to unwind in the cool night air. Villagers traversed Bronx Irish neighborhoods on trolleys for a nickel and children hitched on the back for a free ride. The downtrodden sang in courtyards and alleys for coins and bottle caps. Saturdays were scored by sounds of the Metropolitan Opera streaming from radios and reverberating through windows and alleyways of Bronx Irish neighborhoods. Holidays lured block parties and parades to crowd Bronx thoroughfares. The carnival set up once or twice a year by Jackson Avenue station, casting a nightly glow over the South Bronx. Small shops lined sidewalks and thrived on abundant foot traffic. The South Bronx portion of Westchester Avenue from Wales to 152nd featured Dolan’s Irish Food Store, Olympia Florist, Cushman’s Bakery, an ice cream parlor, a drugstore, a Jewish baker, a candy store and two newsstands. Many shop owners offered store credit to poor Irish families in need of bread, milk or meat for their children. Other neighbors and friends offered support when they could, providing small loans or passing along used clothing to needy families. For a few weeks every summer, thousands of New York’s poor children, including many Bronx Irish, were given a respite from the strains of poverty and city life through the New York Herald-Tribune Fresh Air Fund. Wealthy families welcomed poor children into their summer homes in Upstate New York and Connecticut, providing these young Irish Americans a rare experience to roam the rolling mountains and lush fields outside the Great City, just as their ancestors had roamed the Irish countryside in bygone years.